As human populations grow the floodplains of rivers start to become modified. The video opposite looks at some of the changes and the consequences that can result. See geographyas.info and BBC Bitesize for a range of flood prevention measures. See below for measures that should be covered. You will need to know the pros and cons for each one. This link also gives excellent info on flood prevention measures and has a case study on Yarm (mentioned below). US Army engineers lay concrete mats along the bans & bed to reduce erosion and keep the channel from moving. Curitiba uses parkland for flood relief. Removal of artificial levee at Ouachita river (a tributary of the Mississippi in Louisiana. 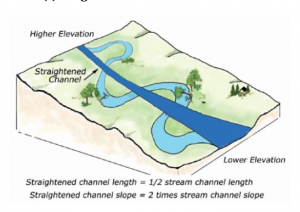 Land-use zoning Channel lining & vegetation clearance See this link for an overview of river flood defences and their application along the River Tees in the UK.